The short biographies in Australian Children's Authors are arranged alphabetically. They include a brief description of the genre and style of each author, and a select bibliography of their publications. Children can browse through the list and look for an author whose work they would like to read. 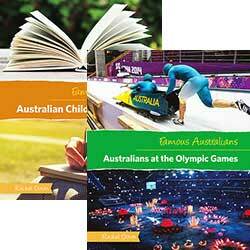 They can also find out about the history of writing for children in Australia. Included are tips for writing your own books and explanations that reveal how a writer turns thoughts into a finished book.